Helps to naturally support healthy blood lipid levels such as cholesterol and triglycerides and is citrinin free. Red Yeast Rice has been commonly used by the Chinese for centuries for helping with blood circulation, indigestion and even diarrhea. Scientist have developed it to help lower blood lipid levels such as cholesterol and triglycerides. 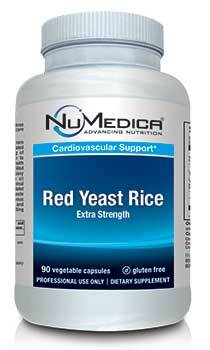 NuMedica Red Yeast Rice comes from yeast that is commercially grown on rice grains. Red yeast rice is rice that has been fermented by the red yeast, Monascus purpureus. The rice and yeast have a deep red color and are ground up into a red powder. Citrinin is a mycotoxin sometimes found in long-stored food that is produced by fungi. It is mainly found in stored grains, but sometimes also in fruits and other plant products. It causes different toxic effects, like nephrotoxic, hepatotoxic and cytotoxic effects. 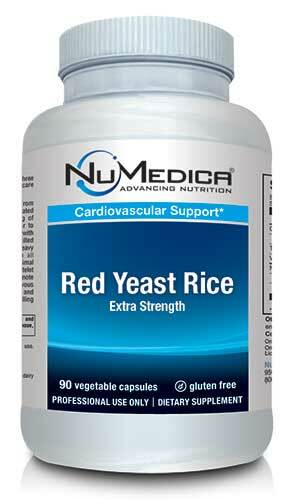 NuMedica's Red Yeast Rice does not contain any Citrinin. Directions: Adults take one capsule daily or as directed by your healthcare practitioner. Other Ingredients: Hypromellose (vegetable capsule), stearic acid, magnesium stearate, and silica. Free Of: Wheat, gluten, corn, soy, animal or dairy products, artificial sweeteners or preservatives. Caution: It has not been confirmed whether red yeast rice inhibits the body's production of CoQ10. Therefore, you may wish to supplement with CoQ10 while taking this product. Do not use if: you are taking prescription medication; you are allergic to yeast; you have liver problems or a serious infection; you&39;re recovering from major surgery; you drink more than two alcoholic beverages a day; or if you are an organ transplant recipient. Not intended for use by children.